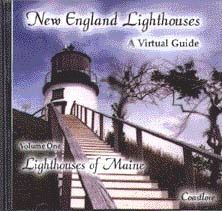 This amazingly detailed CD/ROM, written and produced by Jeremy D'Entremont, a highly reknowned lighthouse enthusiast and writer, is the definitive work in this medium. It not only consists of a history of 68 specific Maine lighthouses-past and present-but it also provides photos, postcards, tour information, area maps, and for selected lights, audio/video presentations. This outstandingly produced CD/ROM will make you want to email Jeremy, urging him to complete the two other originally planned volumes. Order them for friends & family!! Send as gifts ! - Great Stocking Stuffers!! !